Susan: What led you to become a healthcare professional? Where did you study and earn your degrees? Angela: My degree is not in medicine. My undergrad is in applied mathematics (UCLA), and I started the doctoral program immediately after that (in mathematics and statistics) but left for family financial reasons and got a quick MBA instead (UCR). I went to work in Silicon Valley. There I got my MS in MS&E (Stanford). After that, I started my doctoral program at the Claremont Graduate University in Neuroeconomics–a program that was just being born, so I was its first official student. My Ph.D. still says “Ph.D. in Economics” but my dissertation was all neuroscience. In my last year of doctoral studies, I also received an fMRI (functional MRI) certification from Harvard University. I started my healthcare education at home from books and academic journal publications. I now hold a certification in LCHF/ketogenic diets and am completing a few more courses in healthcare, so more certificates yet to come. What led me to move over to healthcare from neuroeconomics: migraines. I suffered from migraines from a young age. I struggled through my education. Then I married a wonderful man and raised two awesome sons and managed a career, despite my migraines. I have no memory of my sons’ childhood or my work and education at all. I really have no idea how I got all that done with constant migraines. I cannot recall–I remember pulling two chairs together in my office between classes to rest at the university I was teaching. I was working in Germany at the prestigious Max Planck Institute as a visiting scholar and fellow, when one day it just hit me that I had enough. I took the next flight home (family stayed in the US while I was doing research at Max Planck Institute) and I started my migraine research that day. I read thousands of academic articles and just about every single book there is on migraines. Susan: How is your approach different from the “Sick care” model of the American healthcare system? What led you to approach things differently than typical paradigms for diet and health? Angela: “Sick care” is a great expression for keeping and caring for the sick. I prefer “health care,” meaning “maintain and care for health” rather than what the modern formula is, which is “keep everyone sick but without symptoms.” Living in Germany opened my eyes to what it is like for healthy people to live without medicines and going to the doctors all the time. This was also true in Hungary, where I grew up, I don’t recall people being sick, taking supplements and medicines. It just didn’t exist. It shouldn’t exist. The “Sick care” approach doesn’t know (or doesn’t want to) search for the cause. There is no money in finding the cause of a health condition and removing the cause. What does a “Sick care” system do with a lot of healthy people? I don’t want to get into politics, but you can see that there is a ton of politics involved. From my limited knowledge, I have become curious about the connection of nutrition and health conditions. I also lived in France and am aware of the French Paradox–meaning the French eat a lot of saturated fat but are the healthiest nation. Having lived there, I observed what the French eat. A typical French day: coffee black for breakfast and out to door for work. Lunch is two hours long and starts with rich saucy fatty meat without any side dish, followed by a side dish if desired, a salad if there is still room, and then a plate of several cheeses. No sweets, no soft drinks. Dinner starts late and long–similar to lunch. Most French eat baguettes maybe once or twice a week. It is not a daily food. At least this is how it was when I lived there in the 1970s. It may be different now. The the French Paradox is not much of a paradox to me: they eat no processed foods, no sweets, no soft drinks, and eat lots of protein and animal fat and no fast foods. This helped me see dietary differences between cultures. Susan: You have written an excellent book about a dietary and hydration plan for managing migraines? What inspired you to write Fighting the Migraine Epidemic and to start the Facebook groups for migraine sufferers? Please share a bit about both so readers can understand. Next, I had to explain excitability, why migraineurs have prodromes, why they go through similar symptoms and what causes those. At the writing of the first book, I really only understood the need for more salt. Since that solution worked extremely well most of the time–not always–I felt the urge to share my knowledge. I didn’t yet have all the answers but I wanted to know if other migraineurs would have the same outcome as I did. So as the first book was published–it was a small book–I also started a Facebook migraine group, hoping people would read the book and extend my understanding by sharing their experiences. The group had a very slow start, as did the 1st edition of the book. Migraine sufferers have been put through the wringer so many times with expensive treatments that never work for long and have major side effects. Many tests cost a lot of money. Families are in complete disarray because of a suffering parent–or in many cases, there is a child–having migraines all the time and on at least 5 medicines. It was very hard to convince people to try to increase their salt. There is a dogma against increased dietary sodium (sodium is 40% salt but in the US, sodium is what is listed on product labels) stating that it increases blood pressure. However, migraineurs usually have such low blood pressure that an increase actually would have been welcomed! The interesting thing is that no one’s blood pressure has increased at all in the past five years of the Facebook migraine groups’ existence–I opened the second group several years after the first one. We had over 4000 migraine sufferers use what is now called Stanton Migraine protocol(R) without an increase of blood pressure for over five years, and they are all migraine- and medicine-free. The 2nd edition of the book was published in September 2017. This new book is a “Complete Guide.” Whereas the 1st edition was a small book of 240 pages, this book is a huge one at almost 700 pages. However, this book contains the entire science behind migraine. It has five parts. Part I is an introduction. Part II is for the migraineur who is in the middle of a migraine and doesn’t know what to do. That section is only about ten pages and gives directions like “if you have this, do this, if you have that do that”, so it is very handy. Part III is the scientific explanation for the migraineur and it is also the part where I explain the Stanton Migraine Protocol(R). It is the longest section and is probably the most interesting. Part IV is for doctors and scientists and part V has citations from 800 academic journals and medical books. The 2nd edition book also includes comments from migraineurs about their experiences. They wanted to help migraine sufferers to understand how the Stanton Migraine Protocol(R) helped them and why. Susan: Do you see exercise as an important part of being healthy? Why? What kinds of activities do you do to stay active and healthy? What do you do to keep your life feeling in balance? Angela: Great question because migraine sufferers often avoid physical activities as a result of their migraines and also because the medicines they take. So the first thing that I wanted to do after I turned migraine-free is to get back into exercise. Unfortunately, I had a bad back injury that prevented me for years from doing anything even after I was already migraine free. In 2017 I took up hiking and jogging, something I really enjoy. Unfortunately, because of my back injuries, I was told by my “surgeon to be” to never run or jog again. 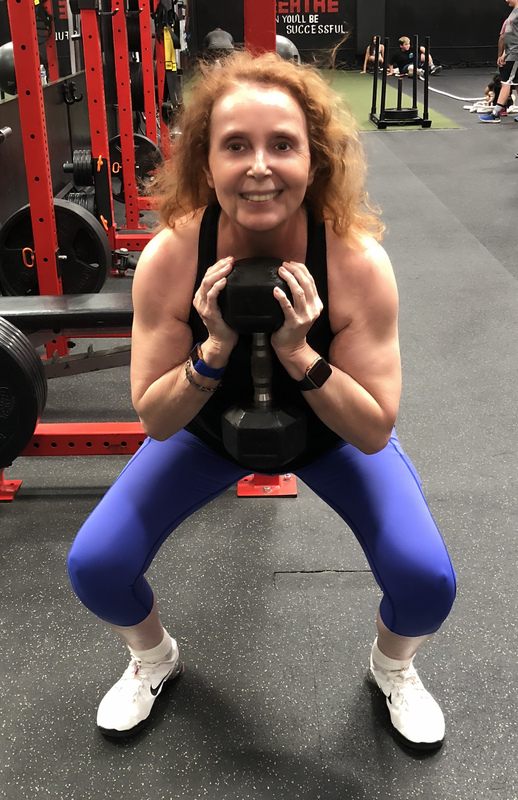 The last thing I wanted was a surgery so I looked very hard into what I could do to help my muscles recover–I completely lost all sensitivity in my left leg for several months, I was in a wheelchair. And so there was quite a bit of muscle dystrophy in my legs and lower back. I needed to get my muscles strong again. At the end of December 2017, I tested out for weightlifting in a small private gym with a private trainer. At that time, I could not do a single squat without falling over, could not get up from the floor, I had no balance at all and found even a 2 lb. dumbbell heavy! After that initial workout, I could barely walk out to my car. My legs felt like they were made from sponges. However, this trainer was very well educated in my kind of injuries and today, nine months after starting, I can lift 120 lbs with my hip, dead-lift 110 lb., and can get up from the floor without any hand assistance at all. The change is amazing–I can actually see muscles now! I work out with weights with a private trainer three times a week, one hour each time. I also picked up kickboxing for a bit of cardio that I missed, about five months ago. I have a different private trainer for kickboxing once a week. It is extremely intense, and as I am 65 now, I use a chest strap for heart monitoring and we watch my pulse on my phone. I work out in zones 4 and 5 but stop when my heart reaches my heart’s maximum and wait until it goes back to zone 4 before resuming. In terms of keeping my life in balance… hmmm… I am not sure I am doing a good job at that. I have never been one to enjoy relaxation much. I think I am a tech junkie and forever student deep in my heart. So for relaxation, I am taking a physiology course now at Coursera offered by Duke and I am also studying Functional Medicine. I am writing a book and several articles. I think the word “relax” doesn’t exist in my life. When I am totally tired and cannot read another word, I listen to books. I am now listening to “Surely You’re Joking, Mr. Feynman!” which I find fascinating because what I did in my life all through childhood till now is what he did as well, only at a different scale. I completely associate with him and his thinking. I truly enjoy that book. Susan: Since I have read your book and am a member of one of your Facebook, I know that you think the typical American diet has many harmful consequences for health. Can you explain why the average American diet is so harmful and how someone wanting to start making a shift can get started? Angela: Indeed, the Standard American Diet (SAD) is very harmful–actually all Westernized diets are. There are several reasons for this but to make it as simple as possible, our diet is dominated by a food category (carbohydrates), which is nonessential. Let me explain a bit. There are 3 basic macronutrients: proteins, fats, and carbohydrates. Essential is something we cannot live without and our body cannot produce on its own and non-essential is something we don’t need as the body can make it as needed. Of these three macronutrients, protein and fat are essential but carbs are not. So why do carbohydrates, a non-essential macronutrient, make up over 50% of nearly everyone’s diet? And by carbs I mean all carbs: grains, fruits, vegetables, nuts, seeds, and sugars (all sweeteners). In other words, we fill our tummies with carbs that we need not eat at all and that puts us at a risk of not eating enough of what we do need, meaning proteins and fats. Carbohydrates have some benefits, such as getting really fast access to energy to, for example, sprint. And how many of us sprint after eating a slice of bread, an apple, a smoothie, a slice of cake or pastry, or a bowl of salad? The consequence of eating so many carbs without burning them off right away is that our body must store what we eat. Carbs contain a lot of water and our body cannot store carbs as carbs. In our body, carbs we didn’t use right away gets stored as fat. This gives rise to all the ill health, including metabolic diseases like chronic insulin resistance, type 2 diabetes, heart disease, hypertension, and obesity. It can all be avoided by avoiding carbs. I am not saying that we all must avoid all carbs but it is best to stick to nutrient-dense carbs! I had a conversation with a Facebook friend the other day who said “he will eat an apple for its nutrients” so I looked up the nutrients in an apple and came up empty-handed. A small apple is equal to 4 teaspoons of sugar but has so little vitamins and nutrients, that just to get a daily recommended vitamin C amount, one would have to eat 20 small apples. That’s 80 teaspoons of sugar! So do we really need to eat that apple? Instead, choose to eat one mini pepper and the entire daily vitamin C and other vitamins are included and the amount of sugar in that little pepper is 1/4 teaspoon. Doesn’t that make more sense? People often tell me that they cannot quit carbs because they love the sweet taste. I understand. We all love sweet taste, it is addictive. But lead is also sweet, as is antifreeze. I won’t eat those just because they are sweet! The harm they cause may seem to dwarf that of the apple but only because consuming them would cause more immediate harm. The antifreeze may be fatal in a day and the apple perhaps in 30 years but the outcome is the same. We also have a malnutrition epidemic and eat more than ever before. And I don’t mean malnutrition of the poor but malnutrition of all segments of the population. That is because while we stuff our tummies full of carbs, there is little thought given to the essential nutrients, such as protein and fat. And our body is made from protein and fat and not from carbs. So when does our body get the nutrient it needs? If we eat a lot of carbs, it doesn’t, and that leads to illnesses that are completely preventable. This includes type 2 diabetes, Chrohn’s disease, arthritis, PCOS, most asthma types, allergies, hypothyroidism, many cancer types, Alzheimer’s disease, IBS, celiac disease, psoriatic arthritis, GERD, thyroid diseases, heart disease, hypertension, stroke, heart attack, just to name a few. Why are we taking medicines for health conditions that are completely preventable by eating the right food? Susan: I believe there is a lot of health information on the internet intended to mislead sick people – due to an agenda to sell a product or push prescription drugs. Can you speak to this? What can people do to educate themselves (from reliable sources) and to become empowered to help themselves become truly healthy again instead of getting stuck in a constant cycle of illness and misery? Angela: Indeed, it is very scary how much misinformation is available on the internet. As I have learned recently, even Wikipedia is biased toward supporting foods, for example, that cause serious health conditions. Why? They likely have a financial incentive. Lately, academia is experiencing a war in nutrition! It is ridiculous that the two opposing sides (those wanting to push a diet high in carbs and those wanting to stop the consumption of lots of carbs) have gotten to an all-out-war where academicians publish complete junk just to kick the other side below the belt. I feel very sad for the consumer because it is very hard to make sense now about what they read on the internet. There are simply no trustworthy sources to turn to. Every single government agency appears to be tied to some financial interest and that seems to lead us toward the big processed food companies, and pharmaceuticals, whose interest opposes that of human health. The best thing I can recommend is to find a website on a topic of interest. Then ask yourself…Are they trying to sell a product? Close that page and look for another one. If it is a scientific academic article, scroll to the bottom and read who funded the research. If you are not familiar with the name of the company, Google it and see if it is associated with food manufacturing, farming, or pharmaceutical companies. If yes, look for a different source! Before you invest in a book, Google the author and see what they sell! If it is just the book, it is fine but if they sell supplements or anything else, it is unlikely to be reliable. Unfortunately, doctors learn “old science” and so most of them are not updated and will lead all their patients down the old dogma-beaten path. If your doctor starts saying salt increases blood pressure, or fat causes heart disease, or that your cholesterol is high, its time to look for another doctor. Susan: Thank you, Angela for taking the time to speak with me. I really appreciate it.